The English Riviera, which covers the three towns of Torquay, Paignton and Brixham, is a resort in the truest sense of the word, attracting thousands of visitors of all ages and interests throughout the year. There is plenty to see and do in Paignton. 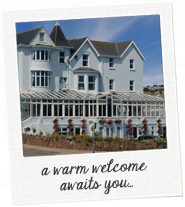 The hotel is a stone's throw from Paignton Cinema with the newly designed Apollo Cinema and the many cafes, pubs and clubs in the area. Families love Paignton. Its long sandy beaches, colourful atmosphere, paddler-friendly waters and first class Paignton attractions are the essential ingredients for a magical family holiday in Devon, with attractions in Paignton like Paignton Zoo, Paignton & Dartmouth Steam Railway and Quaywest Water Park, as well as some nearby popular Torquay attractions like, Babbacombe Model Village, Kents Cavern, Living Coasts, Torre Abbey and Bygones to name a few. During the summer months life seems to revolve around Paignton seafront which comes alive to the sound of laughter and holiday fun. But there is also another side to this distinctive seaside town, which can be found in the elegance of Oldway Mansion, the green coastline around Elberry Cove and the architecture of Palace Avenue and Paignton Cinema. At night Paignton's seafront comes alive with illuminations and is perfect for an evening stroll. Here are just a few of the places of interest, that are only a short journey away. Are you an Agatha Christie fan? Then Torquay is the place for you! It is her hometown and there is an excellent exhibition in the Torquay museum. Agatha Christie was baptized and worshipped at All Saints Church, Torre. Many visitors make an appointment to see the Church where you can hear anecdotes and details of Agatha Christie's early life. You can also visit Greenway House, her house near Kingswear or view her estate from the River Dart, a very pleasant outing. Other Torquay attractions include the Pre-historic Kents Caverns, Babbacombe Model Village, the ancient Cockington Village, River Trips, Fishing Villages and well known Theme Parks like Crealy Adventure Park, which are all a short drive or bus journey away, each with interests for all ages groups. Paignton Zoo This famous zoo is a great way to view animals in their natural habitat. Paignton zoo's emphasis is on conservation and environmental concerns and is sure to keep adults and kids alike amused and interested all day. National Marine Aquarium The National Marine Aquarium is located in Plymouth, around 45 minutes drive from Torquay, is the National Marine Aquarium. One of Devon's most popular attractions, the Aquarium includes several huge tanks featuring sharks, a turtle, sea horses, jelly fish and a wide range of other marine life. Kents Cavern Kents Cavern caves are officially the oldest recognised human dwelling in Britain. Take a stroll through the beautiful caverns and enjoy the same experience as your ancestors did, nearly half a million years ago. Living Coasts In July 2004, we saw Paignton Zoo's latest addition in the form of 'Living Coasts', a unique attraction with underwater views, taking you to the coastal habitats around the world. Situated on Beacon Quay, with spectacular views across the bay, it is a short walk away from Torquay's bustling marina. Paignton & Dartmouth Steam Railway Journey along the beauty of the Torbay coastline to the banks of the river Dart, on this full size steam railway. Enjoy a wonder around Dartmouth 's picturesque town and waterfront, then a relaxing ride back on the steam train or a gentle journey around the coastline by ferry. Woodlands Adventure Park Woodlands Adventure Park is situated just a few minutes away from Dartmouth , you will discover the magic of Woodlands Adventure Park, a real treat for families, or the young at heart. The park has many exciting outdoor activities, enormous water slides, a toboggan run and many indoor and outdoor activity areas for all age groups. Bygones Bygones is just a short drive from the Marine hotel, you will find the popular Victorian experience Bygones. With a range of displays and interesting exhibits, taking you back to the sights and the sounds of the Victorian age. Golden Hind at Brixham This replica of Sir Francis Drake's Golden Hind, gives a real sense of what life at sea really used to be like, and portrays the sense of adventure to be had living in the 16 th century. Babbacombe Model Village Babbacombe Model Village is just a short drive from the hotel, you will discover the popular tourist attraction of the Babbacombe Model Village. With over 400 models making up a miniature West Country, and many special features throughout the year, it is a great place to spend a fun-filled afternoon, or a relaxing evening when the village is completely illuminated. Crealy Adventure Park Crealy Adventure Park is situated just outside of Exeter, about 30 minutes drive away from the hotel, you will discover a theme park designed for the younger members of the family. With fun, small versions of the popular rollercoaster, pirate ship and log flume, combined with grassy picnic areas, inside and outdoor play areas, Crealy Adventure Park , makes for a fantastic family day out! Quaywest Water Park The only outdoor water park to be found in Devon , and certainly the wettest fun to be had during your holiday. Choose from 8 of the flumes, catering for a range of age groups, with a separate swimming and paddling area.